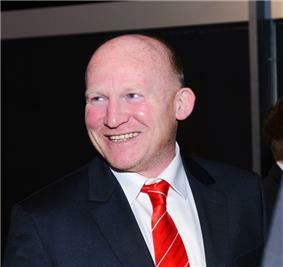 Neil Jenkins MBE (born 8 July 1971) is a former rugby union player and current coach. He played fly-half, centre (rugby union), or full back for Pontypridd, Cardiff, Celtic Warriors, Wales and the British and Irish Lions. Jenkins is Wales' highest ever points-scorer and is the third highest on the List of leading Rugby union Test point scorers. He was the first player to score 1,000 points in international matches. In 2004 Jenkins joined the coaching staff of the Wales national rugby union team and is the kicking skills coach. Jenkins was born in Church Village near Pontypridd, Wales to a scrap dealer and his wife. He attended Llanilltud Faerdref primary school and then Bryn Celynnog Comprehensive school in Beddau. Jenkins joined Pontypridd in 1990, making his First XV debut on 14 April. He made his Wales debut aged 19 on 19 January 1991 against England during the Five Nations Championship in Cardiff, a game that Wales lost 25–6, but Jenkins scored his first three points thanks to a penalty. After the Five Nations campaign, Jenkins missed out on a place in the Welsh World Cup squad – the number ten position having been taken up by Mark Ring. Jenkins' main strength was his kicking, although he was deceptively quick in his early career. Despite this, he still received tremendous criticism and many felt that he was not worthy enough to inherit the Welsh number 10 shirt of Graham Henry, and became an excellent distributor of the ball, notably his excellent flat passes, and also a strong runner. After just 28 test matches for Wales, he became the nation's record points-scorer. Jenkins went on the 1997 British Lions tour to South Africa, playing full back in all three tests. His accurate goalkicking enabled the Lions to beat the Springboks during the first two tests, and thus secure the series 2–1. In the final match of the 1999 Five Nations Championship, Jenkins kicked a conversion in the dying moments of the game to beat England 32–31 at Wembley to deny their English counterparts the title, as Scotland won on points difference, with Wales finishing third. In October 2000, Jenkins was given an MBE for services to sport. He picked up the MBE from Buckingham Palace before being flown back to the Welsh capital by helicopter for a rugby match in which he scored all 24 points for Cardiff in their 24–14 win over Saracens. In 2001, Jenkins became the first ever rugby player to break the 1,000 international points mark, with a 28-point haul featuring a Full House of a try, conversion, drop-goal, and penalty against France in Paris. Jenkins went on the 2001 British and Irish Lions tour to Australia, but was carrying an injury, allowing English fly-half Jonny Wilkinson to become the preferred fly-half and goalkicker. However, Jenkins did gain his fourth Lions cap as a late replacement in the second test. Kicking always remained his major strength – in the 2003-04 Celtic League, he was successful with a world record 44 consecutive kicks at goal for the now defunct Celtic Warriors. His final match for Wales was on 1 November 2002 in Wrexham against Romania, with Wales winning 40–3. Jenkins was left out of Wales' 2003 Rugby World Cup squad, and subsequently announced his retirement from international rugby after an 11-year career. During his 87 caps for Wales he scored 1,049 points (11 tries, 130 conversions, 235 penalties and 10 drop goals) and a further 41 points (1 conversion and 13 penalties) during his 4 caps for the British and Irish Lions for a grand total of 1,090 points. He retired as the only player to score over 1,000 points in international rugby. Jenkins' world record was subsequently broken by Jonny Wilkinson. Despite the early public criticism, Jenkins has established himself as one of the most recognisable figures in Welsh rugby and many rugby fans hold him in extremely high regard. Although he is no longer the leading points scorer in Test history, he is still considered to be one of the most accomplished goalkickers in rugby. In the autumn of 2004 Jenkins returned to the Welsh Rugby Union in the capacity of Kicking Skills Coach, working with the then newly formed WRU Academies to improve the future generations of outside halves. In the summer of 2006 he returned to the National Squad set up as Skills Coach, where he first worked for Gareth Jenkins during the 2007 Rugby World Cup campaign and subsequently Warren Gatland's new-look management team. During the 2007–2008 season, Jenkins helped the Welsh national team to a second Six Nations Grand Slam in four years. On 8 June 2009 it was announced that Jenkins would be joining the British and Irish Lions as specialist kicking coach on their tour of South Africa. In 1999, Jenkins released his autobiography: Life at number 10: An Autobiography with freelance journalist Paul Rees just a matter of weeks before breaking the International points scoring record. The book was republished in 2001 by Mainstream Publishing. Also, on 10 November 2003 a DVD was released as a tribute, called Jenks – A Rugby Legend, the DVD tells the story of Jenkins from his start as a working class boy in the Welsh Valleys to the pinnacle of rugby. In honour of Jenkins' Testimonial career, the famous Grogg Shop in Pontypridd made a "Limited Edition Testimonial Action" Grogg of Jenkins. Wanting to make something special for the occasion, the Grogg was the first ever to stand on just one leg and took over 6 months to create. Only 100 were made, all of which were hand-painted in a variety of rugby kits – only three of which were in the Lions jersey, one owned by Jenkins, one by his mother and the other by Mike Donald of Ebbw Vale who bought the Grogg at an auction for £4,100. ^ "Neil Jenkins playing profile". Pontypridd RFC. 1990-04-14. Retrieved 2013-06-17. ^ a b c "Rugby photographic encyclopedia & rugby union player/hero images". Sporting-heroes.net. Retrieved 2013-06-17. ^ Palmer, Bryn (2003-05-12). "The Ginger Monster bows out". BBC News. Retrieved 2013-06-17. ^ "News | British & Irish Lions |Official Website: Woodward to note Welsh achievement". Lionsrugby.com. 2005-03-22. Retrieved 2013-06-17.